After a recent declutter of my wardrobe I had a list of things I was looking for and I’ve got better at not buying things in sales just because they’re cheap but I did end up getting some things I didn’t have planned on a couple of recent trips to the McArthur Glen Outlet shopping centre in Bridgend. Everything I bought ended up being from the Next Outlet, they have had such good bargains recently, £2 for a good quality top or £10 for some jeans is such a good price if they’re what you want. For years I didn’t get that much from Next but it feels a bit like half of my go to wardrobe comes from there. The Next Outlet stores often have extra reductions, which is what happened with most of the things I’ve bought, beyond the reductions in the normal sales. They also have older stock in lots of sizes sometimes as well as a range of clothes that are exclusive to the Outlet stores in the Special Purchase range. I know some people have said they aren’t the same quality as the standard line, they’re definitely cheaper than equivalents at full price, but I’ve bought quite a few things from them and they last just as well for me. I wish I’d taken more photos, I’m still not that good at remembering to do that when out and about, as the shopping area was so nicely arranged, which sounds like an odd thing to say but not having aisles crammed in and there actually being space in all the shops was really nice. Add in the odd sky on Monday due to the storm in Ireland and the UK and I bet the lake would have looked great in them. With the five hours free parking and range of shops there I definitely recommend Rushden Lakes to anyone local as a place to spend an afternoon wandering and shopping. Though it does seem like most locals already know about it, I seem to have been slow on finding this. Anyway, onto the shops themselves. Though I didn’t get what I originally planned to as there weren’t any of the long tops or tshirts that I liked in my size I did end up getting a few things. In the end I got things from Primark, Marks and Spencer, Holland and Barrett, Flying Tiger (a new favourite shop) and Boots, though it was fun wandering around the rest and I was very restrained when it came to the large beauty section in House of Fraser, I don’t think I’ve seen so much Urban Decay in person before! When I went to Primark last weekend the plan was to check out the beauty section, maybe get a couple of vest tops and see if there was anything decent in the home section. The home section was forgotten about, I need to go back for that I think, and the vests I like weren’t there so I ended up wandering around with mum and seeing what they had. This did lead to a basket full of Harry Potter and Disney things which I did manage to get down to two before we wandered over to the pyjama section and found the unicorn in the haul. Unfortunately their beauty section in our local isn’t the best stocked, though I was impressed by the range of other brands available that weren’t there the last time I checked, and most of the makeup had obviously been poked and prodded which always puts me off. The only things that seemed safe were eyeshadows, I already have too many, and the lip kits which were available in chocolate brown or fantasy glitter. I was tempted by the sparkles but the chocolate brown was too dark for me, I might have to pop in when we go to Vodafone over the weekend and see if they have other colours then. I get the feeling that it isn’t the most popular section of the store as I was the only one looking at it and it didn’t really make me want to stop and browse. This time of year I always get that Spring Clean, time to declutter everything, feeling and this year I finally decided that it was time to admit that my jewellery and clothes were in dire need or a sort out. Quite a few of my clothes haven’t fitted me that well for the past year, since a fun side effect of the medication I’m on made me gain quite a bit of weight around my middle, and oddly my feet too, and changed my body shape. It’s a bit like learning how to dress myself and what suits me all over again, but that’s a topic for another post. Anyway, I decided that I would try everything I own on and anything that doesn’t fit me but is still either new (I did a bit of an overhaul a week before I started the mads so haven’t worn some of it) or that I still loved got put in bags and is now stored under the bed in the spare room. It certainly feels better having a wardrobe full of clothes I can actually fit into rather than one bulging at the seems because it has two sizes of everything! My jewellery was mainly a case of having things I’ve loved for years but not worn them as they aren’t the style I go for any more, though I forgot to photograph what I got rid of annoyingly. Makeup will probably become a few posts, I always love reading and watching decluttering things other people do so they’ll go up when I finish that. I recently had a sort out of my clothes and things and made a check list, I find it’s a great way to make sure you don’t get too distracted when shopping and it means you actually leave with what you went in for (rather than ten new nail varnishes and some tops when you go in for jeans, happens way too often for me). Last week I may have ended up spending more than I meant to when I realised that 90% of the things on my wish list were in TK Maxx and H&M which I was on for other things so this week will probably turn into a bit of a haul week. I was planning on doing them all together but then I realised exactly how much will be arriving from TK Maxx and that one alone may need to be a two parter. So, sorry if you’re not a fan of haul posts. Today’s haul is from H&M and not all that big. My original thing to get from H&M was bras, for some reason no matter how many makes I try the ones from H&M are the only ones that fit me comfortably and unfortunately the H&Ms near me have a very small range available so it’s online I go. 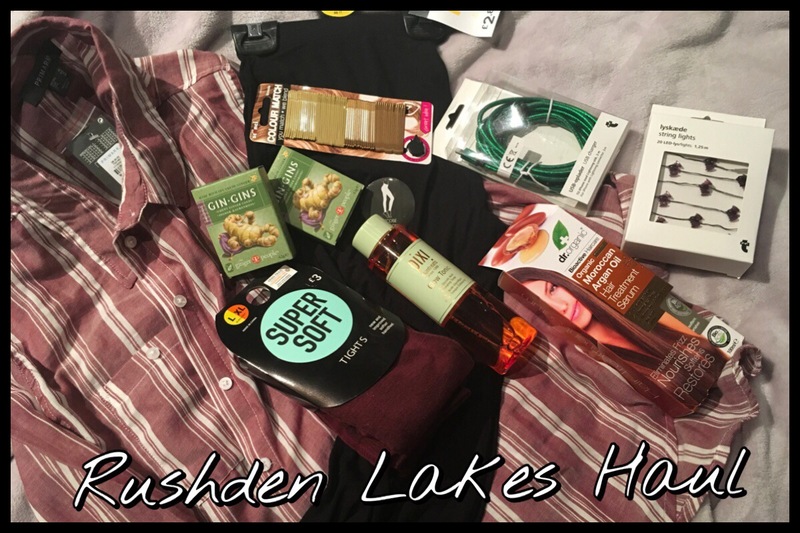 I did end up adding a few extras in here, as well as the T-shirts that I needed, because I have never seen any of the beauty products in the stores near me and wanted to give them a go. I did manage to limit myself to things I actually use or need to replace anyway so I don’t feel too bad. 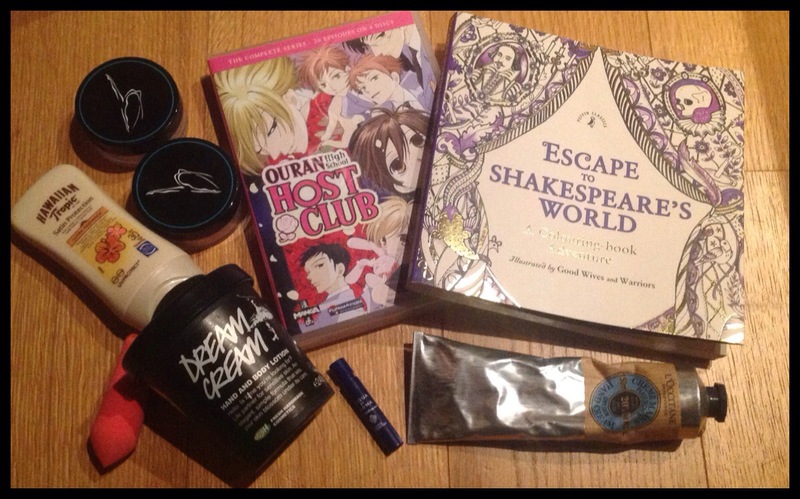 I went shopping today so I thought I’d do a post on the things I bought, though a few of the things from Boots are repurchasing old favourites that I have reviewed in the past I did find a few new things that I am really excited to try. I also went to Matalan and managed to keep it down to three things from there, I could have bought so much more and I found a jacket that I will definitely be buying online as they didn’t have my size in store. I did also go to Pets at Home so I’ve included the few gerbil things I got there too, I wouldn’t normally but I figured it’s not an extra post and it’s something different. I don’t know how many of you are in the UK and how many will have watched Robot Wars when it was first on, or on any of the repeats, but I love that show. As the new series has just started a lot of June and July I was watching the original series to get ready and I was surprised at how early I was watching it originally, it seems I started at series 2 with the original airing. So far I’m liking the new series though I do miss the rhymes from Craig Charles in the later series. Also some of my favourites aren’t in the new one but it was to be expected, I wonder how the original robots would have survived against the new ones. Sorry the external links won’t work for this post, this is the fourth time I have tried to post it and it’s crashed my computer each time. I’ll try to add them tomorrow but I just want to get this post up tonight so it’ll be link free for now. This month I have mainly been using new things, which is unusual as a lot of the time it seems like my monthly favourites are full of old things I have rediscovered. It’s another big mix of things though I think it’s mainly beauty and accessories and a couple of them probably won’t be surprises if you follow my blog given the reviews I’ve given them recently. I don’t think there’s been much music that I’ve been listening to really this month, a bit mix of a lot of older albums I found on my old mp3 player that only works when it’s plugged in so it’s been quite a bit of 90s cheese you get at school discos and early 2000s pop punk. TV shows though I have been watching some new things for once, I loved the Night Manager, I thought that Hugh Laurie and Tom Hiddleston were amazing in it and I really liked Tom Hollander too, he was a jerk but for some reason I liked him anyway. No spoilers so I won’t say any more. I also really loved the RSC Shakespeare Live thing that was on the BBC for the 400 year anniversary of Shakespeare’s death. The ‘to be or not to be’ bit made me laugh and I just liked the range that was on there. I have ended up going back to some old favourites like Red Dwarf and NCIS but those two new ones stood out a lot. I recently made an order on the Joe Browns website and I would have done this post sooner but one of the items was faulty so I had to get a replacement. The good news is the returns were quick and easy and, even though it was only a small fault, they didn’t question it and I had the replacement back here within a week despite using My Hermes which often takes that long one way. I don’t know if you guys find this but there are a few stores that I know if I order them online they are almost guaranteed to fit me well, the shape just suits my body and I know the sizes because of how many things I’ve bought in the past. Joe Brown’s is one of those companies for me. I did end up getting more than I originally intended but some of these things have been on my want list, or something like them, for the past two years so, although it seems like a lot to spend in one go, I am actually pretty much set for clothes this summer. I need a few new vest tops and some T-shirts with print or pattern on them but I’ll just go to Primark for the few things I need.